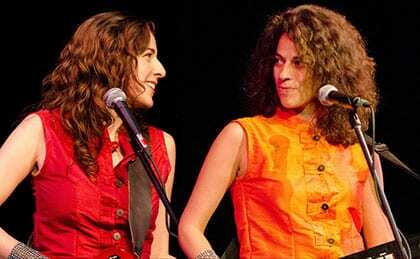 Sahara Jane and Kamila Nasr are sisters known for their close vocal harmonies and mastery of a variety of instruments. Being of mixed cultural heritage and growing up in a musical family in Nova Scotia, their original songwriting is influenced by Brazilian Bossa Nova, Indian Raga and Persian poetry as well as their Celtic roots. Their music is a reflection of the times we live in. After years of musical study and performance around the world, they have returned to the valley to share their insights and sounds in a show that is both poignant and powerful.